Should media organizations be producers of live events in addition to (or instead of being) producers of traditional 'mediated' content? 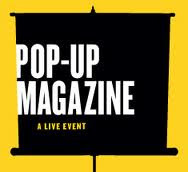 Having experienced Pop-Up Magazine's live journalism event at Davies Symphony Hall last night, I am of the belief that live events can be a fantastic way to enrapture audiences stories of all kinds -- and potentially generate quite a bit of revenue. It's astounding to me that Pop-Up Magazine managed to sell out Davies, which holds several thousand people, within about two hours of opening its box office a few weeks ago. The venue was utterly packed. I haven't seen this much of a turn out since a recent appearance of Yo-Yo Ma with the San Francisco Symphony. The set-up of the event also surprised me in terms of its simplicity. Stage right, there was a microphone and a lectern. Center stage stood a huge projection screen. Stage left was a space for the couple of musical contributions to do their stuff. Beyond that, the stage was huge and bare. Actually, I think Davies somewhat lacks the intimacy that this kind of storytelling soiree needs, though what the event lost in coziness, it most likely gained in income. The event featured a wide array of shortish presentations by journalists and other creative types with a penchant for reportage and storytelling. Contributions ranged from Stephanie Foo's slide-accompanied journey through the early superhero comic book drawings of a few current rising stars in the industry, to A C Thompson's investigation into fabricated death row inmate defense arguments. Some content pieces were better than others. In addition to the two aforementioned contributions, I loved in particular Steve Silberman's look at the sketchbooks of an early Apple employee, Dana Goodyear's affectionate portrait of an old-school gourmand who traveled the world for more than two decades in search of the perfect steak and Charlotte Buchen's beautifully-told "where are they now?" story about a once-famous Iranian boy band of the 1980s and the relationship between their most famous song and Iranian politics and life today. Most presentations featured some use of video or audio in addition to the creator speaking his or her words live on stage. Bonnie Tsui's profile piece about a guy who made a career out of diving for urchins in the waters around the shark-infested Farallon Islands before retiring and launching a new career filming underwater life for scientific researchers, provided perhaps the most engaging example of how a piece of journalism can make the most of the live experience. I enjoyed the way in which Tsui combined reportage with film and a live on-stage interview with the subject. Pop-Up Magazine founder, magazine journalist Douglas McGray, is an inspired curator. He has a leaning towards the sort of ephemera and arcana that appeals to a hipster New Yorker-reading audience, but his scope as an editor is appealingly broad. Nevertheless, some of last night's pieces fell flat. Ironically for a live event, the least successful contributions of the evening were the ones that were most self-consciously performance-oriented and the least journalistic in feel. Chinaka Hodge's slam poetry take on life in the Bay Area parsed through a screened crossword puzzle upon which words in the poem gradually revealed themselves as she spoke was shrilly delivered and didactic. Scott Snibbe's contribution to the evening, which involved an amorphous pixelated doodle "improvisation" projected on the screen from Snibbe's iPad while the Calder Quartet, a string quartet based in LA, performed an uninspired and weirdly truncated version of the second movement of Ravel's String Quartet in F Major (the musicians completely omitted the slow middle section of the piece) seemed completely pointless. Overall, I relish the opportunity that Pop-Up Magazine provides to hear writers perform their own work, rather than the more usual thing (as with your typical writer-focused lecture series) of having writers talk about their work. That being said, great writers don't automatically make for great public speakers and a few of them could use some help in this regard. I also like the way in which the experience isn't recorded or disseminated in any way post-event. This gives the concept a sense of occasion that is so often missing from the experience of opening a magazine or listening to a broadcast. It also makes it possible for a journalist like Mac McClelland to tell a story on stage that, for reasons of preserving the livelihood and even the life of her subject who is in constant danger of persecution, is better left out of online news archives, Lexis-Nexis searches and YouTube. 1. The program was divided into "shorts" and "features" but it wasn't clear to me what the difference was between the two categories. Some of the shorts were quite long and some of the features seemed like the equivalent of "amuse bouches." 2. I admired the quirky way in which Pop-Up Magazine worked with its key advertisers, Skyy Vodka and the Anchor Brewing Company. At two points during the presentation, live "ads" featuring the sponsoring products, each a few seconds long and light-hearted in their approach, were performed on stage. In one of these ads, for instance, a cocktail waitress wheeled a small stand which served as a "bar" on stage and showed the audience how to mix a drink using a Skyy product. Clever. Like I said on the arts journal blog, Thompson has said to everyone regarding Culhane that his involvement was not investigative. His piece at Davies was his own very personal perspective, and not based on an exhaustive investigation of Culhane or the legal case against her. Numerous Compilers utilize the zero position, so a variety of 7 characters has 8 bytes relegated to it. Here is info about it https://www.rebelmouse.com/pamelarobinson/7-things-to-think-about-before-you-write-that-essay-1428352103.html Explore different avenues regarding your compiler of decision so you can perceive how they are doled out, and all the more critically.